Working for several hours can induce pain in your backbone and also it creates lots of health issues as well. Sitting down at your desk continuously for more than 6-7 hours can make you feel restless and tired. It is seen that 70% of the employees do suffer from back pain. Health issues and pain can make the employees irritated and they become frustrated to work. This indirectly decreases the productivity of the workplace. So, if you want to stay fit during your working hours with increasing rate of productivity, you should opt for such facilities that can make you feel relaxed during work. 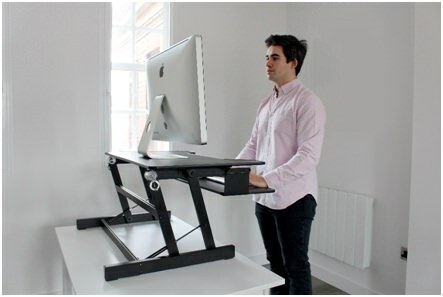 One of such ways is to use the Standing Desk in your workplace or at home. Switching from standing to sitting and doing the reverse and help in increasing the metabolism in your body. This will help in reducing all the physical stresses on the body and always keep you active during your working hours. This will indirectly increase the productivity. Several research studies indicate that it is better to stand at least for 2-4 hours in a day. Thus, with the help of this desk, you can sit and stand often. People that transition over to a Standing Desk usually see and feel the benefits after a couple weeks. Just imagine you are sitting for hours on the chair… This will make you restless and tired. You will experience an immense pain on your back too. But, if you switch between standing and sitting, you will feel happy and relaxed. As you will not feel the pain anymore, your tension and stress will get reduced to a greater extent. The best way to ensure you lose weight is to exercise. Studies have shown that if you stand rather than sit then you lose an extra 30-60 calories per hour. You will get a healthier body it’s a fact. If you are looking for ways to reduce extra fat from your body, you can use the Standing Desk at your workplace or at home. Using a Standing Desk does not work in isolation, proper diet and regular exercise are still necessary to maintain a healthy balanced lifestyle. This is especially important for diabetics wanting to keep in control of their sugar levels and maintain a healthy sustainable lifestyle. This also relates a lot to obesity and staying in control of your weight. When using the Standing Desk, this can help in improving your posture. Sitting continuously for 4-6 hours on a simple chair and increases the risk of back pain and poor posture. Alternating your sitting and standing position throughout the day can do wonders to your posture, less slouching over your computer will mean your shoulders are less hunched and more upright. These are some of the benefits of using the Standing Desk at your office and home. To know more, visit the official site https://uk.backpainhelp.com/ and know about various ways to reduce back pain.